Refractory cytopenia with unilineage dysplasia (RCUD) is a category of myelodysplastic syndrome (MDS) characterized by morphologic dysplasia of a single myeloid lineage with associated peripheral blood cytopenia. An MDS, as defined by the World Health Organization (WHO), is a clonal hematopoietic stem cell disorder resulting in ineffective hematopoiesis. As with all types of MDS, RCUD carries a risk of progression or transformation to acute myeloid leukemia. However, RCUD is considered a low-risk MDS; cases follow a prolonged and sometimes indolent clinical course. However, morphologic and cytogenetic findings alone are considered diagnostic. In the bone marrow, at least 10% of a given myeloid lineage should be affected. Cases demonstrating Auer rods and/or increased numbers of myeloblasts (>5% in bone marrow) are not included in this group (see Refractory Anemia with Excess Blasts). As with all forms of MDS, other causes of myeloid dyspoiesis should be excluded before assigning the diagnosis of RCUD. Exposure to agricultural chemicals and a history of smoking confer an increased risk of the development of refractory anemia (RA) and RA with ring sideroblasts. The precise incidence and prevalence of RCUD have not been well established; however, RA represents the majority of cases of RCUD. Clinical features are often nonspecific and are generally related to the corresponding cytopenia (ie, bleeding associated with thrombocytopenia; fatigue and exercise intolerance associated with anemia). In many cases, the patient is asymptomatic and cytopenia is identified during routine evaluation. 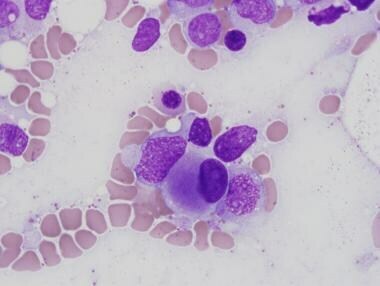 The morphologic features of the peripheral blood and bone marrow (see the images below) are currently the gold standard for the diagnosis of myelodysplastic syndrome (MDS). The presence of hypoplasia does not exclude a diagnosis of refractory cytopenia with unilineage dysplasia (RCUD), because hypoplastic forms are not uncommon, accounting for approximately 10% of confirmed cases of MDS. Importantly, morphologic changes identical to those of dysplasia may occur as an artifact of poor preservation or as a result of inadequate storage during transport of samples; extra caution is advised when evaluating suboptimal specimens. Megakaryocyte dysplasia: hyperlobate nuclei and megakaryocyte aggregates. Erythroid precursor with nuclear atypia. 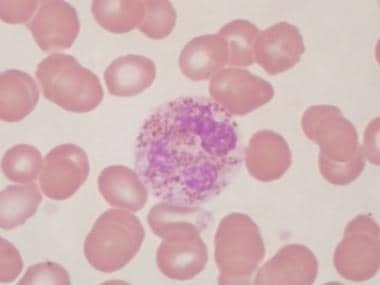 Neutrophil with abnormal cytoplasmic granules. Ring sideroblasts representing fewer than 15% of nucleated erythroid precursors. 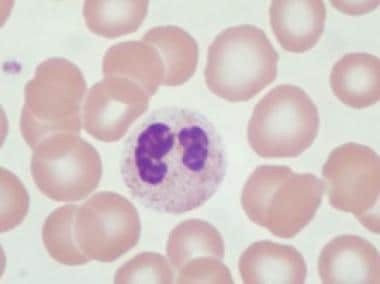 Pseudo–Pelger-Huet cell: neutrophil with bilobed nucleus. 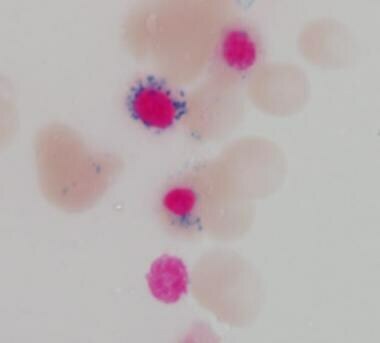 Evaluation of the peripheral blood smear demonstrates 1 or more cytopenias. When affected, the erythroid lineage is characterized by a macrocytic or normocytic anemia with variation in red cell size and shape (anisopoikilocytosis). Platelets may vary in size; giant forms may be present. 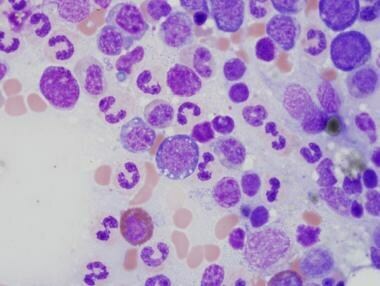 Dysplasia of the granulocyte lineage may be assessed on the peripheral blood smear; hypolobated nuclei and hypogranularity are the most common features. The bone marrow is normocellular to hypercellular; at least 10% of a lineage demonstrates dysplastic features. In addition to nuclear and cytoplasmic atypia, the erythroid series may show megaloblastoid features (ie, dyssynchronous maturation of nucleus and cytoplasm and/or disproportionately large cell size relative to the corresponding normal stage of development); such megaloblastoid features are indistinguishable from those seen in vitamin B12 or folate deficiency. Ring sideroblasts may be present; however, if they account for fewer than 15% of erythroid precursors, a diagnosis of refractory anemia with ring sideroblasts is more appropriate. A report by Gong et al indicated that evaluation of bone marrow imprints provides a more accurate means of diagnosing RCUD than does analysis of trephine biopsy sections. 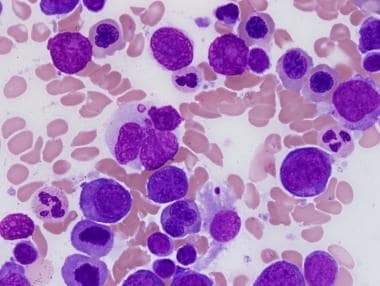 In a study of 3781 patients, the investigators found that, using routine cytochemical staining, bone marrow imprints provided greater diagnostic accuracy than the biopsy sections did for RCUD, refractory cytopenia with multilineage dysplasia, megaloblastic anemia, acute myeloid leukemia, refractory anemia with excess blasts, and lymphoplasmacytic lymphoma. 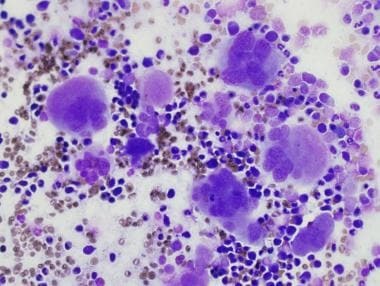 The report also found that for these conditions, the diagnostic accuracy of bone marrow imprints was not statistically different than that of aspirate smears. The morphologic features of erythroid, granulocytic, and megakaryocytic dysplasia are presented in Table 1. Immunohistochemical studies are not necessary in most cases of refractory cytopenia with unilineage dysplasia (RCUD). However, staining for CD34, a relatively specific hematopoietic stem cell marker in bone marrow, may be used to localize immature precursors and to exclude higher-grade forms of myelodysplastic syndrome (MDS). Importantly, CD34 is not lineage specific, and some myeloblast populations do not express CD34; interpretation of staining patterns should not be performed in isolation. Approximately 50% of cases of refractory anemia (RA) have a demonstrable cytogenetic abnormality, most often involving chromosomes 5 or 7. Although abnormalities in RA are limited to a small number of chromosomes, proper characterization is prognostically significant. Too few cases of refractory neutropenia (RN) or refractory thrombocytopenia (RT) have been reported to definitively establish cytogenetic associations. *Adapted from Greenberg P, Cox C, LeBeau MM, et al. International scoring system for evaluating prognosis in myelodysplastic syndromes. Blood. Mar 15 1997;89(6):2079-88.
ΐ Karyotype: Good: normal, -Y, del(5q), del(20q); Poor: complex (>3 abnormalities) or chromosome 7 abnormalities; Intermediate: all other abnormalities. Brunning RD, Orazi A, Germing U, et al. Myelodysplastic syndromes. Swerdlow SH, Campo E, Harris NL, et al, eds. WHO Classification of Tumours of Haematopoietic and Lymphoid Tissues. 4th ed. Lyon, France: IARC Press; 2008. chap 5. Verburgh E, Achten R, Louw VJ, et al. A new disease categorization of low-grade myelodysplastic syndromes based on the expression of cytopenia and dysplasia in one versus more than one lineage improves on the WHO classification. Leukemia. 2007 Apr. 21(4):668-77. [Medline]. Germing U, Strupp C, Kuendgen A, et al. Prospective validation of the WHO proposals for the classification of myelodysplastic syndromes. Haematologica. 2006 Dec. 91(12):1596-604. [Medline]. Matsuda A, Germing U, Jinnai I, et al. Differences in the distribution of subtypes according to the WHO classification 2008 between Japanese and German patients with refractory anemia according to the FAB classification in myelodysplastic syndromes. Leuk Res. 2010 Aug. 34(8):974-80. [Medline]. Strom SS, Gu Y, Gruschkus SK, Pierce SA, Estey EH. Risk factors of myelodysplastic syndromes: a case-control study. Leukemia. 2005 Nov. 19(11):1912-8. [Medline]. Gong X, Lu X, Wu X, et al. Role of bone marrow imprints in haematological diagnosis: a detailed study of 3781 cases. Cytopathology. 2010 Dec 3. [Medline]. Della Porta MG, Malcovati L, Boveri E, et al. Clinical relevance of bone marrow fibrosis and CD34-positive cell clusters in primary myelodysplastic syndromes. J Clin Oncol. 2009 Feb 10. 27(5):754-62. [Medline]. Truong F, Smith BR, Stachurski D, et al. The utility of flow cytometric immunophenotyping in cytopenic patients with a non-diagnostic bone marrow: a prospective study. Leuk Res. 2009 Aug. 33(8):1039-46. [Medline]. Loken MR, van de Loosdrecht A, Ogata K, Orfao A, Wells DA. Flow cytometry in myelodysplastic syndromes: report from a working conference. Leuk Res. 2008 Jan. 32(1):5-17. [Medline]. Della Porta MG, Malcovati L, Invernizzi R, et al. Flow cytometry evaluation of erythroid dysplasia in patients with myelodysplastic syndrome. Leukemia. 2006 Apr. 20(4):549-55. [Medline]. Malcovati L, Porta MG, Pascutto C, et al. Prognostic factors and life expectancy in myelodysplastic syndromes classified according to WHO criteria: a basis for clinical decision making. J Clin Oncol. 2005 Oct 20. 23(30):7594-603. [Medline]. Breccia M, Latagliata R, Cannella L, et al. Refractory cytopenia with unilineage dysplasia: analysis of prognostic factors and survival in 126 patients. Leuk Lymphoma. 2010 May. 51(5):783-8. [Medline]. Park MJ, Kim HJ, Kim SH, et al. Is International Prognostic Scoring System (IPSS) still standard in predicting prognosis in patients with myelodysplastic syndrome? External validation of the WHO Classification-Based Prognostic Scoring System (WPSS) and comparison with IPSS. Eur J Haematol. 2008 Nov. 81(5):364-73. [Medline].